Benjamin Netanyahu’s attack on Gaza has stoked a fever pitch of hard-line nationalism. Ashkelon and Sderot, Israel—As Israel’s war on Gaza continues six days after the assassination of Hamas military leader and key ceasefire negotiator Ahmed Jabari, the country’s south has become a nationalistic war zone. Two days after air-raid sirens went off for the first time in Tel Aviv since the 1991 Gulf War—and for the first time in Jerusalem since the 1970s—the journey to Israel’s Gaza border is interrupted by air-raid sirens, while the roads are filled with busloads of troops and flatbed trucks carrying tanks. When sirens wail in the southern city of Ashkelon, traffic stops as soldiers and civilians of all ages run for cover. Unlike Gaza, however, daily life returns to normal soon after Israel’s Iron Dome anti-missile system intercepts rockets fired by Hamas, with local residents gathering for coffee inside the city’s malls. Angered by Israel’s violation of a two-day lull in violence as a ceasefire was being hammered out, Hamas and much of the Arab world have accused Israeli Prime Minister Benjamin Netanyahu of starting this conflict to strengthen his domestic position ahead of Israel’s January elections. Meanwhile, the hard-line nationalism of the 2008 Gaza war that propelled Netanyahu to office is re-emerging in the south, as Israelis adopt a wartime outlook. Many Israelis hold an uncompromising, militaristic perspective on war, rallying around the government in times of crisis while blaming the enemy, regardless of context. Israel’s military supremacy and the Iron Dome system’s staggering success rate seem to be making Israelis feel secure enough to not feel an immediate need to end the violence. So far at least 125 Palestinians, about half of them civilians, have been killed, as well as four Israeli civilians and one soldier. If Israel’s wars in Lebanon are any example, it’s only when casualties escalate that questioning of war becomes prominent. Bardov reflects that sentiment, saying that while he would support a ground war in Gaza if the government deemed it necessary, he is not in favor, primarily because of the cost to Israeli soldiers. He also expressed a desire to avoid increased civilian casualties in Gaza, which could harm Israel’s international standing. “Of course the Iron Dome has created a reality here, both tactically and strategically, because it gives the army the time to think and decide whether to send the ground troops in or not,” he says. His view is a liberal one in Israel. He was sitting with Albert Peretz, a middle-aged resident of the border town Sderot and brother of former Labor Party leader Amir Peretz, who fell from grace after being publicly held responsible for botching Israel’s 2006 invasion of Lebanon. Both Albert Peretz and Bardov are reluctant to criticize the government, despite clear reservations. Echoing Netanyahu’s rhetoric, the two unquestioningly blame rockets from Gaza for starting the conflict and are unwilling to compromise until armed forces in Gaza accept defeat. “My guess is [Hamas] thought that with the situation in Egypt and elections in Israel, they had an opportunity, and they made a mistake, because I think they are going to pay a very heavy price…. One of the things [a ceasefire] depends on is how quickly the Hamas people fold up,” says Bardov. Closer to the border, as troops and military equipment pour in, the sonic boom of warplanes, the buzzing of drones and the chopping of Apache helicopters is nearly constant. Here there is a palpable atmosphere of blind rage amid the rocket fire. Ignoring the assassination that set off this escalation, Oren Weitzman, a student at Sderot’s Sapphire College, calls for a further intensification of Israel’s assault. “They are just waiting for us to do something stupid [like declare a] ceasefire, and [then] shoot on us. Because everyone knows they can’t hold an agreement,” contends the shaggy-haired young man. Weitzman is wearing an Obama T-shirt while standing on a cliff on the edge of Sderot, about a mile from the Gaza border. The interview is interrupted by air-raid sirens, as we quickly duck for cover with other locals behind a jeep. In a blaze of fire, Israel’s Iron Dome fires a missile to intercept the incoming rocket, but it misses. Smoke billows from a house about 200 yards behind us. Israeli strikes in response are already producing their own plumes of smoke from Gaza. Moments later, Weitzman and the other local residents are back on the edge of the cliff, boisterously cheering a passing convoy of troops heading for the border. The troops respond with piercing war whoops. His rhetoric is familiar. The idea that Palestinians should be bombed relentlessly was common during Israel’s 2008–09 war, bolstering an election discourse that propelled Israelis far to the right. On the same cliff hours later, local teens shy of draft age gather to watch the nighttime flashes of bombs over Gaza. They talk about flattening the strip, with its 1.7 million people. Aside from these small gatherings, the border area is eerily quiet; checkpoints limit access, and frequent air-raid sirens keep most people off the streets. “This is a staging ground, under military closure of the highest order,” I am told while being turned away at a checkpoint a few miles from the Karni border crossing as a bus full of soldiers passes by. Although Israel has delayed a ground operation amid ceasefire talks, the army has already deployed many of the 75,000 reservists the government authorized in its call-up. The house I stay in just outside Sderot shakes through the evening from the explosion of rockets and mortars fired by Hamas’s Qassam Brigades and the shock waves from Israeli jets pounding Gaza. Israelis seem to have little appetite for stopping this war before crushing resistance and re-establishing a sense of deterrence. Yet armed forces in Gaza don’t seem to be blinking, and have retaliated throughout the days and late into the evenings. As the night drags on, a few hours of relative quiet emerge on the Israeli side as the rocket fire and mortars relent, but the regular explosions on the Gaza side continue. 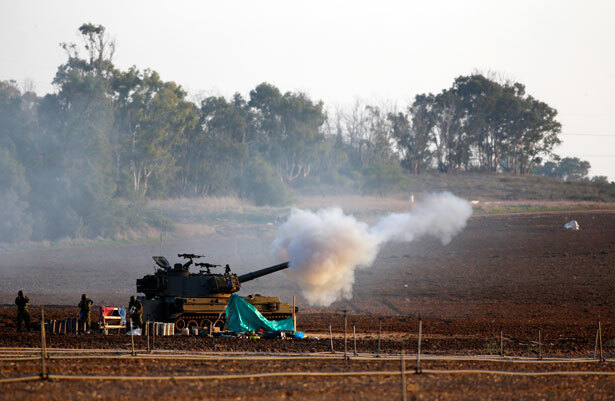 By morning the sound of air raid sirens, mortars and the Iron Dome are back. Is Israel losing control of its escalation? Netanyahu has tried to sustain the fervent nationalism that arises when the public believes Israel has unquestioned military deterrence. Now, though, he bears the stigma of being commander in chief when rockets were fired at Tel Aviv for the first time in twenty-one years. If he uses this conflict to try to regain that sense of dominance, the end could be a long way off. For more on the unfolding situation in the Middle East, read Sharif Abdel Kouddous's post on Egypt's Mohamed Morsi in the Middle.